The heterogeneous nature of the oral tissues and structures provide a diverse and unique ecological habitat to the oral microorganisms that are distributed in various niches such as dorsum of the tongue, mucosal surfaces, teeth and in saliva. The complexity of the oral microbiota is further enhanced by the fact that the mouth is the only body part where mineralized hard tissues (the teeth) are naturally exposed to the external environment. Advances in the molecular techniques have helped us understand the diversity of the microbial communities and over 700 cultivable bacterial species have been identified in the oral cavity. This resident bacterial flora plays an active role in the maintenance of the oral health by contributing to the host defenses preventing exogenous microorganisms colonization and thus profoundly influencing the host physiology. Such species that live in equilibrium with the host immune defense systems are termed as commensals. The resident bacterial microflora in the healthy human mouth is mainly of streptococcal species such as Mutans, Mitis, Salivarius, Sanguis, Oralis and Gordonii, Veillonellae and Actinomyces. The host–microbiota co-dependence is maintained by the host providing a nutrient-rich environment to the microbiota while the commensal microbes secrete metabolites by nutrient processing, prevent infections by pathogenic microbes and maintain homeostasis by stimulating immune responses. Disruption of this equilibrium and reorganization of the microbial composition have been implicated in several diseases such as diabetes, dental caries and periodontal diseases. Research in oral cancer, particularly the oral squamous cell carcinoma (OSCC) has gained momentum in the recent past, and a better understanding of its etiopathogenesis is prudent for early diagnosis and better management. One such area of interest is the oral bacterial flora in oral cancer research that has gained worldwide attention in the past few years. Past studies have demonstrated an increased number of microbes in cancer patients and with the WHO classifying Helicobacter pylori as a definite carcinogen, interest was sparked regarding the possible relationship between bacteria and oral cancer. On the other hand, with the above-stated facts and observations, the role of oral commensal bacteria in oral cancer cannot be established since H. pylori is not a normal commensal of the oral cavity. There is growing evidence about the alteration and increase in the oral microbiome picture in patients with oral cancer. Possible links have also been suggested in the past, but controversies surround the fact whether the oral bacterial flora is the cause or consequence of the pathologic process or it is a matter of coincidence. Do they initiate, promote, or merely show an affinity for the tumor? Another query raised on this subject is whether preexisting cancer affects the host immunity facilitating secondary microbial colonization. On the other hand, the protective role of oral microbiome against exogenous microbes and its contribution to the innate host defenses may indicate a possible protective role against oral cancer, thereby reducing its risk. Hence, the exact relationship of oral bacterial microbiota and the oral carcinogenesis process needs to be unleashed. The authors suggest that there is no direct causative role of oral bacterial flora in the pathogenesis of oral cancer. It may serve as a synergistic factor with the other commonly known risk factors such as alcohol abuse and smoking. The point supporting this statement is the conversion of alcohol into its first metabolite and a known carcinogen, acetaldehyde through the alcohol dehydrogenase activity of certain bacteria such as streptococci, other Gram-positive aerobic bacteria and Gram-negative aerobic bacteria like Neisseria. Although no evidence exists regarding the role of oral bacteria in the initiation of carcinogenesis, there is a possibility that these organisms are involved in the promotion and progression of oral carcinogenesis. Alternatively, the elevated levels and the alterations in the oral bacterial flora composition could be an apparently unrelated finding due to poor oral hygiene after OSCC. The presence of a number of pathogenic bacteria such as the various periodontopathic organisms may adversely impact the disease prognosis, thus emphasizing the significance of optimal oral hygiene maintenance in these patients. It cannot be denied that the resident oral microflora forms a nonpathogenic commensal community contributory to the host defense system. However, due to an alteration in the ecology of the affected site a shift in the balance of the components of the resident microflora, may contribute to oral carcinogenesis. 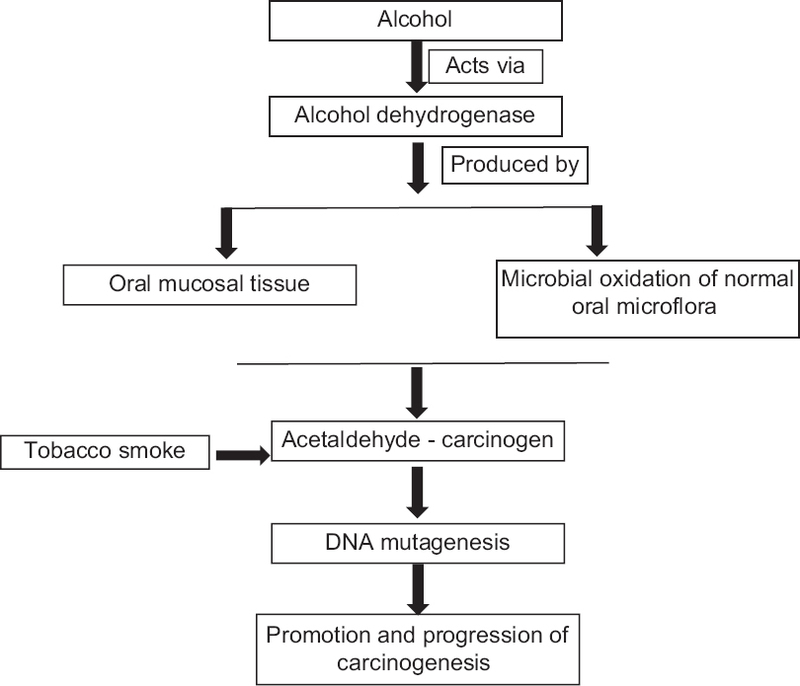 Oral microbiota not only increases oral cancer risk by local activation of alcohol- and smoking-related carcinogens  but also are involved with cancers of the distant sites suggesting the role of few systemic mechanisms in this oral microflora associated carcinogenesis. Various studies have linked periodontitis, which is a well-established microbial disease with increased risk of esophageal, pancreatic and gastric cancer. This is because certain oral bacteria reach the GI tract irrespective of the differences in the oral and gut microflora population. Blaser and Atherton, concluded that H. pylori infection spawn a strong host immune response, resulting in gastric inflammation, achlorhydria and epithelial atrophy and dysplastic changes. Infection with H. pylori has now been linked with over a two-fold increased risk of gastric cancer overall. According to Vogtmann & Goedert (2016), tooth loss and periodontitis are associated with increased esophageal cancer risk pointing to a possible role of the oral microbiome in malignancy. Another study by Yu et al. revealed the association of esophageal squamous dysplasia with an altered composition (i.e., beta diversity) of the upper gastrointestinal microbial community. Meyer et al., suggested a link between tooth loss and increased risk of pancreatic cancer. Oral cancer research has garnered tremendous attention from researchers across the world owing to the high mortality and morbidity rates with tobacco and alcohol consumption being the primary risk factors. An estimated 15% of oral cancer develops in the absence of the common risk factors. Recent evidence has suggested that microbes may act as a mediator in the etiologic relationship with oral cancer. Furthermore, variations in the bacterial community have been noted in smokers and alcoholics. Various studies and a growing body of literature have implicated human oral bacteria in the etiology of not only oral and gastrointestinal cancers but also pancreatic and hepatic cancer. In a study of oral carcinomas, Nagy et al. revealed that the surface of tumors showed increased numbers of certain members of the oral microbiota as compared to the control sites. Rajeev et al. (2012) analyzed 217 DNA samples prepared from the head-and-neck squamous cell carcinomas to examine the involvement of Streptococcus anginosus infection in the head-and-neck cancer. Sasaki et al. concluded that infection of S. anginosus could occur frequently in OSCC and that dental plaque could be a dominant reservoir of the S. anginosus. Mager et al. determined the relationship of 40 common salivary bacteria counts between oral cancer patients and controls and reported that OSCC patients tend to have significantly elevated concentrations of certain bacteria in their saliva. High salivary counts of Capnocytophaga gingivalis, Prevotella melaninogenica and Streptococcus mitis could serve as potential diagnostic indicators of OSCC. Another similar study also found raised concentrations of bacteria in the saliva of oral cancer patients. In 2006, Hooper et al. conducted a study wherein he found the difference between bacterial microbiota composition present within the tumorous and non-tumorous mucosa were apparent, perhaps indicating selective growth of bacteria within carcinoma tissue. While the link of pathogenic bacteria and oral cancer cannot be denied, the role of oral commensal bacteria in oral cancer remains to be understood. Commensal bacteria are the species of bacteria that live in equilibrium with the host immune defenses. Streptococcus is most often the predominant genus in the healthy oral microbiome, and less frequently Prevotella, Veillonella, Neisseria and Actinomyces, Fusobacterium, Porphromonas, Treponema, Eubacteria, Lactobacterium, Capnocytophaga, Eikenella, Leptotrichia, Peptostreptococcus, Propionibacterium and Haemophilus dominate an individual's oral microbiome. Commensal bacteria compete for nutrients and receptors with exogenous microorganisms rendering them a critical component of the innate host defense system. They also produce antagonists such as bacteriocins that cause inhibition of susceptible extrinsic bacteria. In addition, lipopolysaccharide of the microbiota, maintain a persistent expression of MHC class II molecules on macrophages and other cells and stimulate the cross-protective antibody production. In other words, the resident microflora serves as a barrier to the exogenous species thus contributing to the host defense mechanism. The literature review also suggests that Neisseria, a frequent inhabitant of the oral mucosa, possess high alcohol dehydrogenase enzymatic activity that converts ethanol to acetaldehyde which is an established carcinogen. The ability of the oral microflora to produce acetaldehyde in ethanol incubation was also investigated by Srinivasprasad et al. (2015). The local microflora may promote carcinogenesis by converting ethanol into its first and genotoxic metabolite acetaldehyde. Numerous studies confirm this hypothesis, and till date, streptococci, other Gram-positive aerobic bacteria, and yeasts have been linked with acetaldehyde production. Acetaldehyde is not only produced from ethanol in the epithelia by mucosal alcohol dehydrogenases but also much higher levels are obtained from microbial oxidation of ethanol by the oral microflora. Acetaldehyde has been classified as a group I carcinogen to humans by the International Agency for the Research on Cancer and is supported by several epidemiological and biochemical studies. Acetaldehyde produces mutagenic effects such as DNA adducts, DNA cross-linking, aneuploidy, or chromosomal aberrations by inducing DNA damage. Homann et al. showed that smokers even after moderate alcohol intake revealed up to seven times higher concentrations of salivary acetaldehyde compared with nonsmokers. Tobacco smoke contains acetaldehyde and repeated exposure to it might lead to the selection of microbes that are capable of high rate acetaldehyde metabolism and are more tolerant to acetaldehyde. According to Salaspuro and Salaspuro, Homann et al., chronic smoking modifies oral flora to produce more acetaldehyde from ethanol. This indicates that the saliva of oral cancer patients has increased potential for harboring more microbial flora. Thus, the oral bacterial flora may act in synergy with the primary risk factors such as alcohol abuse and smoking in the oral cancer pathogenesis. Since, the oral microbiome is one of the most important sources of local acetaldehyde, improving oral hygiene can interfere with this acetaldehyde production [Figure 1]. The dynamic balance among the oral microbial communities gets disturbed by significant changes in the oral environment. A shift of oral microbial balance in favor of non-resident pathogenic microbes is observed in various oral diseases. Periodontal disease involves a shift in bacterial flora in the gums, accompanied by a potentially pathogenic inflammatory response. It has also been hypothesized that poor dental health facilitates the conversion of ethanol to the mutagenic acetaldehyde through the metabolic activity of bacterial enzymes which, in turn, is linked to oral cancer. Mager et al. explored the relationship of common salivary bacteria counts among oral cancer patients compared with counts from their healthy counterparts. A significant increase in the C. gingivalis, P. melaninogenica and S. mitis counts was observed among the cancer patients. On further analysis, these species were found to exhibit 80% sensitivity and 82% specificity, respectively, as potential diagnostic markers for oral cancer. Kang et al., (2009) revealed a significant increase in the levels of Porphyromonas gingivalis, Tannerella Forsythia and Candida albicans in cancer group than in normal controls. The study also found that the prevalence of Streptococcus sobrinus in healthy group was significantly lower than in patients with the head-and-neck tumors. Streptococci species are predominantly isolated in head-and-neck cancer. Sasaki et al. hypothesized that streptococcus anginosus in dental plaque could cause infection of the oral mucosa which may lead to DNA damage due to the increased synthesis of NO and cyclooxygenase-2 resulting in carcinogenesis of the infected tissues. OSCC surfaces show significantly raised levels of Porphyromonas and Fusobacterium as compared to the healthy mucosa. Whitmore and Lamont  have explained the role of P. gingivalis and Fusobacterium nucleatum in oral cancer. Thus, the presence of various periodontopathic organisms may have an increased predisposition to oral cancer [Figure 2]. However, the question that needs to be answered is as to why infection with these organisms causes disease in only few individuals? The community nature of oral infections and the potential limiting influence of other beneficial resident bacteria may partly answer the question. Furthermore, since cancer exhibits multifactorial etiology, specific oral bacteria and their associated inflammatory insults may play a contributory, if not an exclusive role. On the other hand, a study conducted by Zhang, et al. revealed that Lactobacillus sp. A-2 metabolites have a probable role in the inhibition of growth and induction of apoptosis of human tongue squamous cell carcinoma CAL-27 cells in vitro. According to them, probiotics (the deliberate use of organisms to restore colonization resistance) microorganisms metabolites may exhibit anti-tumor functions acting directly on cancer cells, but also may exert antimicrobial activities, which in theory also could impede cancer development. There is growing epidemiological evidence regarding the link between oral microflora and malignancies. Both pathogenic and the commensal strains of bacteria seem to play a role in oral carcinogenesis. To conclude, it can be safely postulated that though the normal oral bacterial flora may not have a direct role in epithelial dysplasia and OSCC, possibilities of their involvement exist when they occur in conjunction with other known etiological factors such as smoking and alcohol consumption. 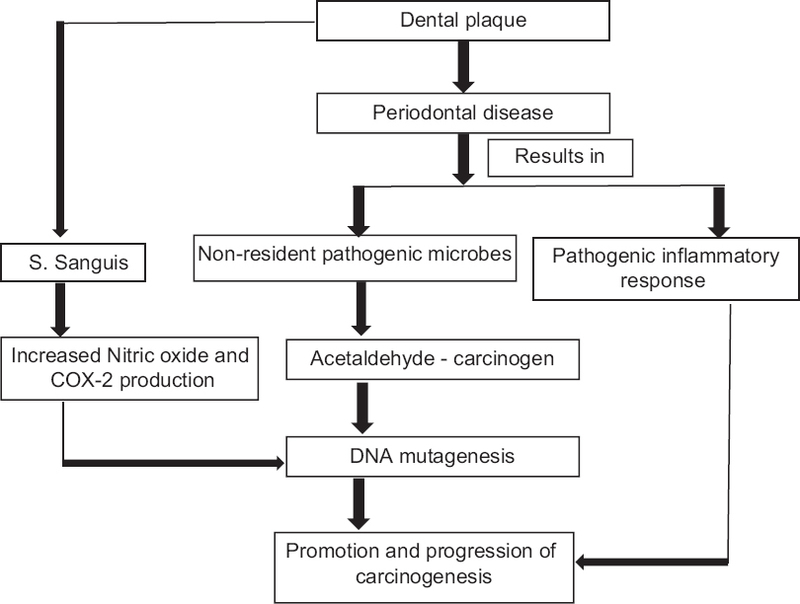 Since the ecologic shift from the resident microflora to the nonresident pathogenic microbes is a significant finding in oral carcinogenesis, maintenance of oral hygiene in these patients is warranted. Furthermore, clinicians need to be aware of the beneficial protective properties of the resident microflora, and their treatment strategies should be focused on the control rather than the elimination of these organisms. The normal microbial composition of the body is believed to have major health benefits for the host which brings up the incorporation of the concept of stabilizing microbiota that is compatible with health as a means to maintain oral health. “Prebiotics” (agents that encourage the growth of the normal microflora) and “probiotics” (the deliberate use of organisms to restore colonization resistance) may become available. Avoiding alcohol and tobacco would be the best way to reduce local aldehyde exposure to the oral mucosa. A thorough exploration of the biological behavior of the altered oral microbiota by isolating the various strains associated with oral cancer and profiling them using next-generation sequencing methods may be productive in the assessment of their exact role if at all in carcinogenesis and their usefulness in the therapeutic regime of OSCC. Fluctuations in the oral commensal microflora in association with cancer development can serve as a potential diagnostic indicator. Marsh PD, Martin MV. Oral Microbiology. 5th ed. Edinburgh, UK: Churchill Livingstone; 2009. Kerr R. The oral microbiome and cancer. J Dent Hyg 2015;89:20-3. Erturk-Hasdemir D, Kasper DL. Resident commensals shaping immunity. Curr Opin Immunol 2013;25:450-5. Björkholm B, Falk P, Engstrand L, Nyrén O. Helicobacter pylori: Resurrection of the cancer link. J Intern Med 2003;253:102-19. Vogtmann E, Goedert JJ. Epidemiologic studies of the human microbiome and cancer. Br J Cancer 2016;114:237-42. Ahn J, Chen CY, Hayes RB. Oral microbiome and oral and gastrointestinal cancer risk. Cancer Causes Control 2012;23:399-404. Blaser MJ, Atherton JC. Helicobacter pylori persistence: Biology and disease. J Clin Invest 2004;113:321-33. Yu G, Gail MH, Shi J, Klepac-Ceraj V, Paster BJ, Dye BA, et al. Association between upper digestive tract microbiota and cancer-predisposing states in the esophagus and stomach. Cancer Epidemiol Biomarkers Prev 2014;23:735-41. Meyer MS, Joshipura K, Giovannucci E, Michaud DS. A review of the relationship between tooth loss, periodontal disease, and cancer. Cancer Causes Control 2008;19:895-907. Nagy KN, Sonkodi I, Szöke I, Nagy E, Newman HN. The microflora associated with human oral carcinomas. Oral Oncol 1998;34:304-8. Rajeev R, Choudhary K, Panda S, Gandhi N. Role of bacteria in oral carcinogenesis. South Asian J Cancer 2012;1:78-83. Sasaki M, Yamaura C, Ohara-Nemoto Y, Tajika S, Kodama Y, Ohya T, et al. Streptococcus anginosus infection in oral cancer and its infection route. Oral Dis 2005;11:151-6. Mager DL. Bacteria and cancer: Cause, coincidence or cure? A review. J Transl Med 2006;4:14. Srinivasprasad V, Dineshshankar J, Sathiyajeeva J, Karthikeyan M, Sunitha J, Ragunathan R, et al. Liaison between micro-organisms and oral cancer. J Pharm Bioallied Sci 2015;7:S354-60. Hooper SJ, Crean SJ, Fardy MJ, Lewis MA, Spratt DA, Wade WG, et al. Amolecular analysis of the bacteria present within oral squamous cell carcinoma. J Med Microbiol 2007;56:1651-9. Avila M, Ojcius DM, Yilmaz O. The oral microbiota: Living with a permanent guest. DNA Cell Biol 2009;28:405-11. Muto M, Hitomi Y, Ohtsu A, Shimada H, Kashiwase Y, Sasaki H, et al. Acetaldehyde production by non-pathogenic Neisseria in human oral microflora: Implications for carcinogenesis in upper aerodigestive tract. Int J Cancer 2000;88:342-50. Meurman JH. Oral microbiota and cancer. J Oral Microbiol 2010;2. DOI: 10.3402/jom.v2i0.5195. Chocolatewala N, Chaturvedi P, Desale R. The role of bacteria in oral cancer. Indian J Med Paediatr Oncol 2010;31:126-31. Salaspuro V, Salaspuro M. Synergistic effect of alcohol drinking and smoking on in vivo acetaldehyde concentration in saliva. Int J Cancer 2004;111:480-3. Whitmore SE, Lamont RJ. Oral bacteria and cancer. PLoS Pathog 2014;10:e1003933. Mager DL, Haffajee AD, Devlin PM, Norris CM, Posner MR, Goodson JM, et al. The salivary microbiota as a diagnostic indicator of oral cancer: A descriptive, non-randomized study of cancer-free and oral squamous cell carcinoma subjects. J Transl Med 2005;3:27. Kang M, Oh J, Kim H, Lee I, Choi H, Kim Ok, et al. Prevalence of oral microbes in the saliva of oncological patients. J Bacteriol Virol 2009;39:277-85. Zhang G, Zhang J, Wang X, Yang W, Sun Z, Kumar CN, et al. Apoptosis of human tongue squamous cell carcinoma cell (CAL-27) induced by Lactobacillus sp. A-2 metabolites. J Appl Oral Sci 2014;22:282-6.